With Outlook Export Wizard you can convert emails into Word documents or share them in a format suitable for publishing on the Web. You can also convert other email formats into Outlook and preserve the file and folder structure. Very powerful, yet very simple to use and requires no previous experience or expertise. Outlook Export Wizard is a powerful yet simple, 1-2-3 solution to converting your Outlook emails into a variety of other documents, such as Word files, or for converting email files from PST format such as pst to eml and pst to msg so they can be used in Outlook. You can also convert Outlook files into email formats suitable for use with other leading email solutions and still preserve the folder structure and personalized information and settings. Download Outlook Export Wizard NOW! There is no need for endless hours of frustration with Outlook Export Wizard – you do not need to have specialist training or experience – just follow the on-screen instructions and let Export Wizard for Outlok do the rest for you! Outlook Export Wizard is a very fast download which is quickly setup and executed. Once downloaded to your computer, you now are in possession of a very powerful Outlook email utility which is very easy to use – as easy as 1-2-3 and a child can use this email tool with ease. 64-bit Outlook Compatible – Outlook Export Wizard can be used with the 64-bit Microsoft Outlook edition, so now all Outlook versions are supported by Export Wizard tool. Simple Interface – so simple a child can use it! With a fast download, you simply let Outlook Export Wizard guide you through the program setup and then through the conversion process in a 3-step process. You do not need any specialized computer training or experience – you may never have done a conversion in the past – it doesn’t matter as Outlook Export Wizard handles it all for you! Retain Outlook file structure – Outlook Export Wizard will maintain the file and folder structure of converted files, which means the information you want is exactly where you left it after the file conversion has taken place. Extract Calendar Information – you can extract and convert your Outlook calendar, personal notes and entries and other customized aspects of Outlook and convert them into a new file format without losing your customization or personal data and organization. Simplified Email Backup – Outlook Export Wizard allows you to extract Outlook files and save them in a .msg format (this is a conversion of .pst to .msg) which simplifies and facilitates the email backup process. Email Filtering – Outlook Export Wizard lets you filter your emails, for instance by including or excluding email files with attachments or by size parameters. Converting Email to HTML format – if you wish to publish your emails to the Web, you can simply and easily convert the .pst files into HTML format which is suitable for use on the Internet. By converting .pst files into .mht format, this preserves the embedded graphics, hyperlinks and other features which can then be used in presentations or simplifying archiving of emails. Convert Outlook to Other Email Clients – Outlook .msg files can be simply and easily converted to “The Bat!” and other email clients (RFC822 format based), MSG, EML, EMLX and PST. Outlook Export Wizard has a very simple interface for users of all abilities and computer levels to use. You do not need any prior experience or any specialist computer training. 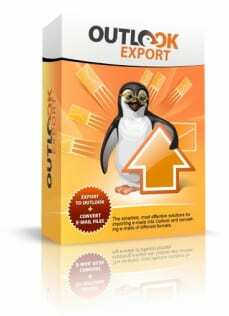 Outlook Export Wizard is a multi-function file export and conversion utility. Data extraction – Outlook Export Wizard converts the selected files and stores them where you choose – you are now free to use the converted files however you wish! Outlook Export Wizard is an invaluable tool for helping you to maintain and backup your email archive. Outlook users will readily attest to the fact that your email database is going to get larger and larger over time – so it is essential you back it up regularly. You can make this easier by using Outlook Export Wizard to convert Outlook email files to .MSG format which is easier to backup. Outlook Export Wizard ( Export Wizard for Outlook ) will keep your file and data organization for use after conversion. Once you have performed a .PST file conversion you will still see your Outlook folders and sub-folders organized in the same way. This makes it simple to find your information, including Calendar information, notes and personal customization of Outlook features when they are converted into other file formats. Save time and energy with Outlook Export Wizard! Download Outlook Export Wizard TODAY! By the time you have read this you could have already converted a few of your Outlook emails!